The titular character, Sazae Fuguta. An ancient Japanese comic strip that dates back to 1946 and, perhaps more notably, holds the world record for the longest running animated series of all time  new Sazae-san episodes have been airing since October 5, 1969, making it a pop culture staple of Japan. It almost always has higher TV ratings in Japan than any other anime (and even most other TV shows period), and by a significant margin. Airings of Sazae-san in its Sunday evening timeslot regularly have viewership numbering over a tenth of the entire Japanese population. In other words, it's a pretty big deal. Despite this, it is not very well known outside of its home country. The series centers around Sazae Fuguta, a somewhat typical Japanese housewife with very young siblings. Each episode of the anime is made up of three self-contained stories. It focuses on aspects of traditional Japanese daily life and culture, and hearkens back to an earlier, simpler, less rushed time (since both series are so old), and relies on a Japanese sensibility to appreciate. Hence, its popularity in Japan and obscurity everywhere else. Outside of 50 episodes from the first year (which are on Amazon Prime Japan), the TV series has never been released on home video due to the dying wishes of its creator, Machiko Hasegawa. This is probably the reason why it has never been dubbed into English or any language besides Japanese. However, some of the original comic strip has been released bilingually as The Wonderful World of Sazae-san and later The Best of Sazae-san . Compare it with La Familia Burrón in Mexico, which also deals with similar topics and also being a Long Runner. The nearest American parallel one can draw is, perhaps, Peanuts. Absentee Actor: No. 93 "Happy Birthday", which aired on May 1970, is the only episode where Sazae doesn't appear. Katsuo and Wakame play the main role instead. Art Evolution: The animation style was much more cartoony in the very early episodes. The series (particularly the comic) happened to cover the period where "traditional" Japan was replaced by "Westernized" Japan. Early in the comic's run, most characters, including Sazae herself, wore traditional dress (kimonos, geta, etc). By the time the anime started over 20 years later, most characters had switched to wearing Western clothing. Adorably Precocious Child: Depending on the episode/strip, this role goes to Wakame (Sazae's youngest sibling) or Tarao (Sazae's three year-old son). 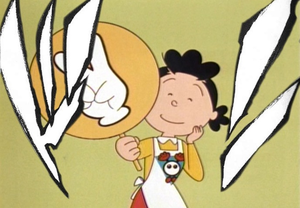 Credits Gag: In the anime, Sazae's pet cat Tama is credited as "?". No one has any clue who it is in the anime's history. Cursed with Awesome: One strip is about a woman who's cursed with a husband who cares extremely little about their wedding anniversary. When she tells him it's their anniversary and he's forgotten about it, he just gives her some money to buy a gift, since he can't be bothered to go out and buy one himself. The awesome part is that since he never can remember the correct date, she can tell him it's their anniversary multiple times a year to get extra money, and he won't catch on. Early Installment Weirdness: The family in general was a lot more dysfunctional in the early episodes. Sazae was more overbearing and frequently nagging to her husband Masuo, Namihei frequently exhibited that he has neurosis, with the family not respecting him all that much, and Katsuo, Wakame, and Tarao were a lot more bratty and mischievous who constantly fought with each-other. All of this was toned down in the decades the show's been airing. Tarao being a brat in early episodes was even lampshaded once where Sazae receives a letter from someone saying he preferred it when he was more mischievous. In a rare moment of breaking the fourth wall, it was revealed that the letter was written by one of the show's writers, who was caricatured in the end. Flashback with the Other Darrin: Subverted. One episode had characters reminiscing about events that happened in a very early episode, back when some of the characters had different voice actors. Rather than redub those scenes, they used it as is, complete with the original voices. It was REALLY noticeable. It should be noted there was a 40-year gap between the original episodes and the flashback. Hoist by His Own Petard: In order to get out of going to school, Katsuo says he's got a stomach ache. When everyone else shares some cake, he realizes that this wasn't a very good move. Housewife: Both Sazae and her mother Ume. Lipstick Mark: Turns out to be from the little sister playing with lipstick and wiping it off with the nearest cloth object, a married man's shirt. The animation example. It began in October 1969 and is still airing to this day, 50 years later. Over 2,500 half-hour episodes have been made. The original manga was a long runner too, lasting 28 years (1946 to 1974). Men Can't Keep House: Subverted with Namihei, Sazae's father, at least in regards to cooking. One episode talks about when Ume was out of town, he packed her an "upside-down" bento. Katsuo and Wakame beg him to make their bentos the next morning. Red Oni, Blue Oni: Sazae and her husband Masuo. She is perky and easily excitable with a wicked temper, Masuo is more calm and reserved. RockPaperScissors: Episodes often end with Sazae playing jankenpon (the Japanese equivalent to rock-paper-scissors) with the viewer. Serious Business: When Sazae threatens to tell Masao the ending of the mystery novel he's reading, he ties her up and gags her to stop her. Slice of Life: Helps to explain its popularity in Japan and obscurity everywhere else. The plethora of jokes about daily life in Japan aren't relatable outside of Japan. Theme Naming: Most of the major characters are named after seafood, reflecting the time period the strip was created in — one of the aims of the creator was to hearken back to times of full stomachs. The series began in 1946, just after World War II, when much of the population was still teetering on the brink of starvation. Three Shorts: Since its first episode, the show has followed this format. Thus, there are more than 7,500 segments altogether. Trope Maker: Sazae-san is the first comic that consistently uses 4 panels. It's the trope maker for Yonkoma. Yonkoma: One of the earliest of its kind.